Armand Gervase has it all. He is a famous artist, his paintings are hung in national galleries, and he is celebrated worldwide. His best-known painting, depicting an alluring Egyptian woman about to murder her lover, is known for its minute, historic detail, yet Armand has no experience with Egypt's ancient past . . . or does he? Rejecting the idea of heaven and hell, soul and spirit, Armand embraces a life of decadence which allows him the freedom to act as he pleases -- until he meets the seductive and hypnotic Princess Ziska. Haunted by strange and distant memories of her, Armand attempts to unravel her mystery, only to discover his memories of her are centuries old -- and she looks terrifyingly similar to the female in his celebrated painting. How can this be? Has he fallen in love with a ghost, or is there something more sinister lurking behind Ziska's hypnotic eyes? 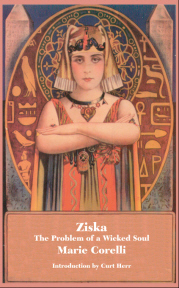 A supernatural tale of reincarnation, seduction, and revenge, Ziska was a bestseller upon its publication in 1897. In the new introduction to this edition, Curt Herr examines the novel in relation to the other two great Gothic bestsellers of 1897, Bram Stoker's Dracula and Richard Marsh's The Beetle, and calls for a reconsideration of Corelli as a major figure in Victorian popular culture.